Waiting and patience (in waiting) are not counted among my virtues. This is not be confused with a “fast food” mentality of wanting my desires fulfilled the moment the idea pops into my mind. It is more of realizing a need or desire and growing impatient and frustrated when the journey takes longer than I anticipated. This is one of the items I am addressing currently in my life. Lately, the waiting has become excruciating; as something I’ve desired and anticipated comes painfully near, only to slip away as I draw closer. Instead of falling into the mire of disappointment and despair, I decided to proactively attack the root of my issue. Recently a friend shared the concept that we are all not alone in our life journeys, that by realizing we are not set up to struggle alone. I had heard of this author, Gabrielle Bernstein, and her book, The Universe Has Your Back. I would like to say, “I found it”, but actually I believe The Universe personally put this resource in my hands. The moment I opened the book, my spirit resonated with the concept and the truth. If you haven’t had the chance to delve into this amazing process, please consider it. As you begin to walk through the chapters, you may find that your soul starts to sign the song trapped within. At least I did, and I hope you also discover your melody. 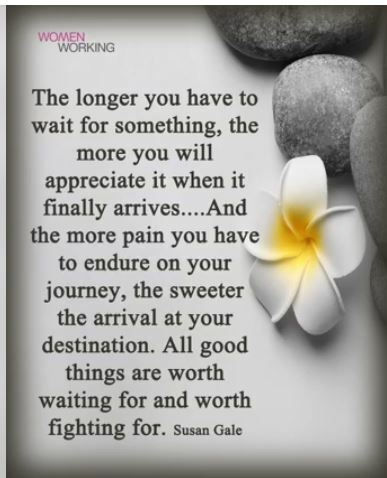 The longer you have to wait for something, the more you will appreciate it when it finally arrives…And the more pain you have to endure on your journey, the sweeter the arrival at your destination. All good things are worth waiting for and worth fighting for. I long for this truth to manifest in my life, you see the “thing” I am waiting for has been my desire for more than 30 years. My journey has been filled with joy, sadness, elation, despair, heartbreak, and unbelievable bliss. I believe I am closer to my arrival than any time since the beginning. As I continue the wait, I revel in the day to day gratitude I experience. If you wish to share your journey, feel free to leave a comment. I will continue to share my experiences, trials, tribulations, and insights with all of you.